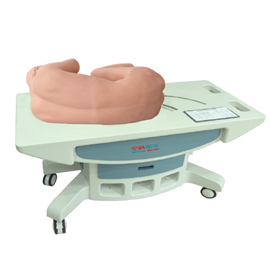 Simulated human stays in lateral position, lumbar anatomic structure is precise, sign marker is obvious: waist and legs are movable, system could automatically simulate human to adjust to puncture or stretch position in according to clinical requests, which is applicable for lumbar puncture, epidural block, lumbar anesthesia, caudal nerve block, sacral nerve block and lumbar sympathetic nerve block. The product includes movable trolley, which is easily moved, maintained and storage for accessories; it could automatically inject and evacuate liquid for system; it is designed with modules, lumbar puncture module is easily replaced. It is divided into two modes, which are training and examination modes. During training, operator could real-time observe the needle inserting position and puncture depth; during examination, indications of needle inserting position and puncture depth will automatically conceal. After the examination, needle inserting position and puncture depth indications show again. It is available to simulate the real clinical situation of lumbar puncture; there is resistance when inserting to ligamentum flavum; there is no resistance when puncturing ligamentum flavum; there is negative pressure when needle inserts into cavum epidurale; simulated cerebrospinal fluid flows out when inserting to cavum subarachnoidale. Cavum subarachnoidale pressure could be set up as various value on the basis of tightly hold and stretching position; there is an alarming prompt when wrong puncture occurs.